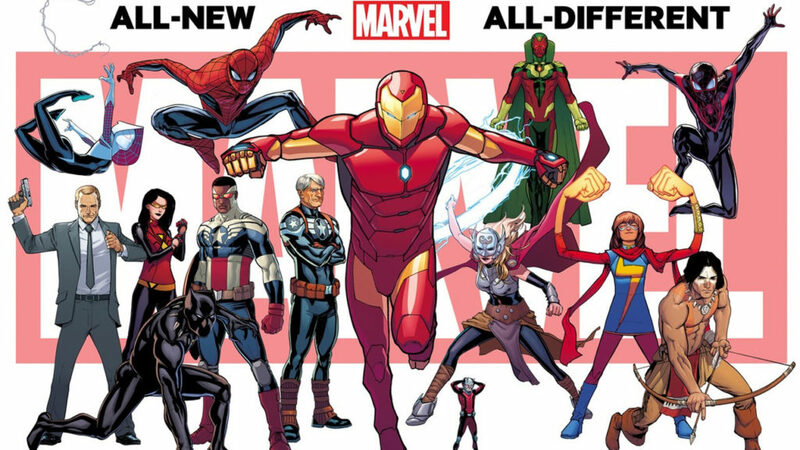 Following 2015’s Secret Wars mega-event, the Marvel Universe relaunched with an All-New All-Different lineup of comics and rosters. Although this means a whole bunch of new #1 issues, and new comic book series titles, the reality is that this Marvel Universe very much follows the continuity determined during Marvel NOW!, with a few Secret Wars influenced updates and changes. Below I’ve put together an order of story arcs sorted according to character group and theme. This will help you navigate all the comics published during the first wave of All-New All-Different Marvel, prior to crossover events like Avengers: Standoff, X-Men: Apocalypse Wars, and Civil War II. All-New All-Different Marvel Fast Track Guide: 20 Essential Comics! The ‘Trade Reading Order’ is my recommended order, and also includes issue numbers for Marvel Unlimited readers. You’ll also find the first 3 months of All-New All-Different Marvel Comics releases, according to Marvel’s publication calendar in the ‘Issue by Issue’ order. Note for Marvel Unlimited readers that many of these relaunched series share names with previous Marvel series, sometimes launched in the same year (see: Duck, Howard the, or Squirrel Girl, The Unbeatable). The easiest way to ensure you’re starting with the right #1 issue is to look for a release date from October 2015 and after. Although released during 2015’s Secret Wars, the Rick Remender and Jerome Opena graphic novel, Rage of Ultron, is set after the events of Secret Wars are complete. You can read my full review of the graphic novel here. The first arc of Invincible Iron Man is one of the most directly connected post-Secret Wars comic in the All-New All-Different Marvel lineup. Definitely start here. One of my absolute favorite All-New All-Different comics, and perhaps the best cosmic explanation of what happened to the Marvel Universe after Secret Wars. Listen, I don’t feel any better about including Deadpool among the solo ‘Avengers’ than you do, but this is the All-New All-Different way of things! Note that issues #7 and #8 are Avengers Standoff tie-ins included in the event reading order above. Uncanny Avengers issues 7 and 8 are part of the Avengers Standoff reading order above. Only issues #5 to #7 occur prior to Civil War 2. See below for the unexpected connections to Deadpool comics. Scarlet Witch #9 is a Civil War 2 crossover. Note that the Bendis & Maleev Iron Man crosses over with Civil War II during issue #4, so you should only read the first three issues prior to the mega crossover event! Only issues #1 to #3, and Free Comic Book Day 2016 #1 occur prior to Civil War II. Some of the developments in Captain Marvel will have been seen more clearly in the first Ultimates volume, but I like Captain Marvel as more of a lead-in to Civil War II, as Carol is one of the major players. Ultimates Vol. 2 collects issues #6 to #11. Only #6 should be read prior to Civil War II (it’s an important one! ), and then issue #7 is included as a ‘Road to Civil War II’ tie-in. Hellcat #8 is a Civil War 2 tie-in. Where does Death of X fall into the reading order? Is there a specific Marvel Unlimted reading order starting after Secret Wars? Hi, firstly thanks for the work you’re putting in. I was just wondering if the reading order was more about publication date rather than the stories chronological order? I can only really comment on the X-Men section as i am reading both team comics and solos (I’m only reading team comics for avengers) but All New Wolverine (#1-6) should be read before the story arc of All New X-Men (#1-6) and Old Man Logan (#1-4) should be read before Extraordinary X-Men (#1-6). Are you planning on being more detailed with it or are you just going to leave them as ‘Trade Reading Order’? Don’t mean to sound ungrateful just got used to being spoon fed the correct reading order from your other pages. Hi! You have A-Force vol. 1 as #1-#5, but I think it’s just supposed to be through #4. Along with that, the series is never brought up again in the list, so I’m not sure when I would be supposed to read them. Just letting you know in hopes of fixing it! First: There is only one Collected Volume, which is #1-#6(not 1-5). Second: #8 is already a Civil War II Tie-In. I was wrong. Checked out again and you’re right… It’s #1-#4. I guess you could just read #1-#7. How much of this new series/relaunches are actually relevant to the new Marvel U as a whole? The Mockingbird, Carnage, Hellcat and Squirrel Girl series don’t feel like they’re part of a bigger whole. Please correct me if I’m wrong about this. Although Hellcat isn’t relevant, it’s one of the best series ongoing atm. Hi, I didn’t know where to ask this but… When does the free comic book day dead no more Spider-Man prelude and the civil.war 2 Spider-Man miniseries take place chronology in the amazing Spider-Man comics? Thanks! To be clear, I haven’t read anything yet of this period of Marvel comics. I’m waiting for a definitive reading order before doing so. However all that I have written above is from wiki searches and a couple of hours in the nearest comic book store flicking through some comics. But back to your question. Dave might disagree on it, and if so we’ll be hearing it, but I think the answer to your question is as follows. Amazing Spider-Man Vol. 1 and 2 (#1-18) are before Civil War II and there for before the Spider-Man Civil War II miniseries. Also before CWII but maybe during ASM #1-18 he is running around with Deadpool in Spider-Man/Deadpool, Vol. 1 (#1-6) and has a quest spot in All-New Inhumans, Vol. 2 (#5-9). ASM #19 might be the first after Civil War II. But lets wait for Dave’s blessing on this. The FCBD issue Captain America: Steve Rogers/Amazing Spider-Man is a continuity knot. The Cap part is set before Captain America: Steve Rogers #1 and before Civil War II. The Spidey story, though, is a prelude to the upcoming Marvel event Dead No More, which will launch after Civil War II in the latter part of 2016. So that story isn’t connected to anything yet, and just like FCBD 2015’s Avengers #1 is a look ahead into the future of Marvel comics. Meaning Spidey will survive Civil War! Who knew? Right? Message for Dave: Any idea where Avengers #1 is to be read in conjunction with All-New, All-Different Avengers? Thanks in advance. Hopefully this is an answer to your question, Trevor! I assume this list is still very much under construction. So here are a few things from me you might look into some more. But I guess you are already doing that. – Gwenpool’s first appearance is in Howard the Duck #1, so shouldn’t she be grouped after Howard the Duck, Vol. 1? Also, Doctor Strange pops up in one of her comics, so maybe that gives us a hint on if it is set before or after Doctor Strange, Vol. 2. – In the Amazing Spider-Man & Silk: Spider(Fly) Effect Infinite Comic, which isn’t listed anywhere yet, Silk is already in Black Cat’s gang. Meanwhile Spider-Man doesn’t seem to use his “glowing” suit yet, so this might indicate that this is before Amazing Spider-Man, Vol. 1 and after Silk, Vol. 1? – Doctor Strange, Deadpool, and Power Man and Iron Fist have a bit of a continuity knot. > Deadpool: Last Days Of Magic takes place after Doctor Strange #7, Deadpool #12 takes place after Doctor Strange #8. > Deadpool #13 is a crossover issues, including: Deadpool #13, Daredevil #7.1, Power Man and Iron Fist #4.1, Deadpool #13.1. So this splits up Daredevil, Vol. 2 and Power Man and Iron Fist, Vol. 1. – Uncanny Inhumans, Vol. 1 features Spider-Man, so this may be after Amazing Spider-Man, Vol. 1? – Scarlet Witch, Vol. 1 apparently adds Uncanny Avengers Annual #1, does this make sense? – The original graphic novel Rage Of Ultron is set in the eight months between Secret Wars and All-New, All-Different, correct? What story line is created by New Avengers 7? I don’t see it listed here and am so confused by it, 1-6 is a story than 7 starts a fun thing w the maker then boom into Standoff? I hope you can explain thanks. New Avengers #7 leads into the Avengers Standoff event – link included for ‘Next’ steps after ANAD.